Layered textures and contemporary furnishings refresh this country cottage. “For as long as I can recall, I grew up riding and showing horses in the Virginia countryside,” recalls decorator Bethany Brower, who shares an interior design business with her mother, Nancy Powell. “I’ve always wanted to live in ‘horse country,’ so when my husband and I decided to purchase a home, we knew where to look,” she says. 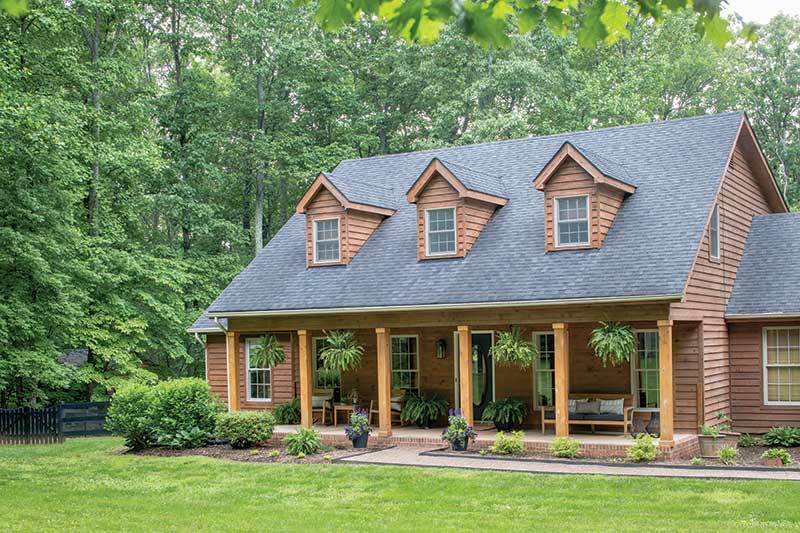 In 2015, the couple bought a three-bedroom, 2,100-square-foot cedar cottage on 10 acres of woodland in Warrenton, Virginia. Though it was fairly updated when the Browers bought the home, it was not entirely to their taste. “The farmhouse was pretty much builder-grade,” says Bethany, adding, “I knew I wanted to make it leaner and a bit more modern.” The Browers and their three dogs moved in, savoring their new habitat, and then, bit by bit, they refashioned the farmhouse to suit their needs. 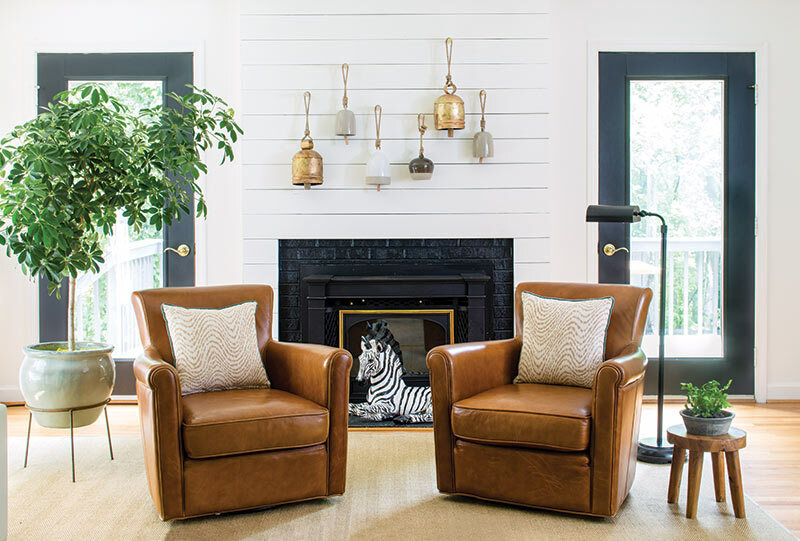 The living area’s once dreary red brick fireplace was framed out in a faux shiplap surround that runs from floor to ceiling, drawing the eye up. “We wanted the look of shiplap [but] on a budget, so we used 1×6-foot pine boards, spaced them with nickels, and finished them in the same white paint we used on the walls,” says Bethany. Next, the staircase was updated with freshly painted white risers and an unexpected glass wall in place of the old posts and banister. 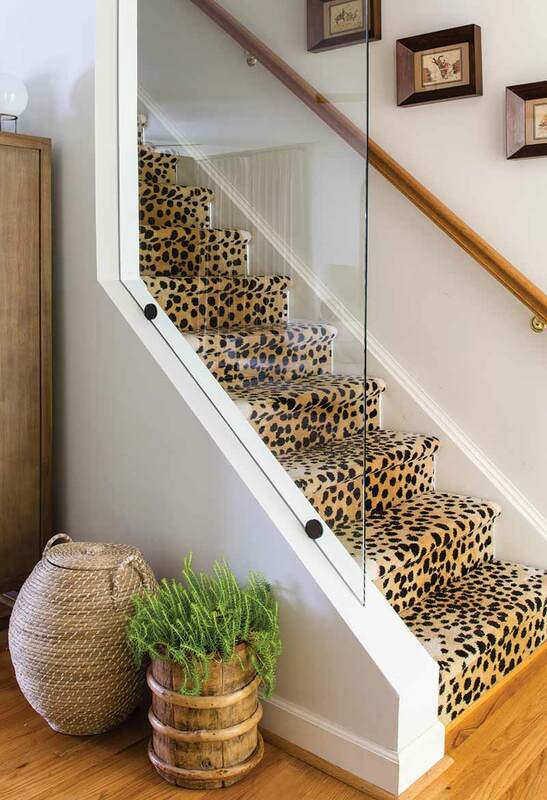 The cheetah-print runner is fun and easy to maintain with the family’s dogs.